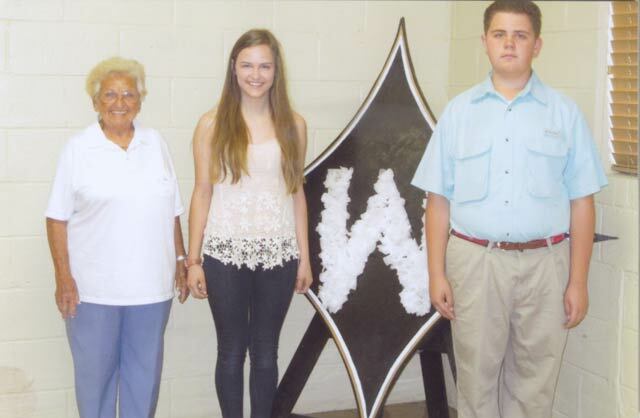 Essay winners, Beth Warnken and Turner Miles Peeples (far right); far left is Mrs. Piekielniak of the American Legion Auxiliary, sponsoring organization. Two Edgefield County students won first place in the state for their essays sponsored by the American Legion Auxiliary. Turner Miles Peeples, a seventh grade student at Wardlaw Academy won in category three which is for grades 7 and 8. Beth Warnken, a tenth grade student at Wardlaw Academy, won for category IV which is for grades 9 and 10. Each year the American Legion Auxiliary sponsors an Americanism Essay Contest for students in grades 3-12. Students from schools throughout the county submitted essays. Winners within the schools participating follow. Other Wardlaw winners were Scott James, second place high school; Davis Wash, second place middle school; Ethan Anderson, first in elementary school and Ansley Nicole Crumback, second place. At W.E. Parker Elementary Carolina Brooks Pettigrew was first place and Summer Williams second place. At JET Middle School Madelyn Wise was first place and Noah Kowalewski was second place. At Strom Thurmond High School Carly Hutcherson was first place and Andy Hoffmann was second place. At Merriwether Elementary School Danny Bennett was first place and Dawson Kulp was second place. Congratulations to all of these students. Webster’s Dictionary says that freedom is the state of being free. I don’t know if that really explains it well enough for my family. This is because, unlike other families, freedom means a lot of different things to us. For instance, my dad stands for freedom to my family. He has been all over the world building schools in third world countries, repairing buildings and lands after earthquakes and hurricanes, and fighting in Iraq and Afghanistan. When he is serving our country, he is encouraging freedom and a better way of life to all of those who need it most. Freedom to my family means my dad and other soldiers standing on line to make sure we get to go to the church of our choice or for girls like my sister to be able to go to college to be a doctor. Freedom of religion is important to my family. We have the liberty to worship our God, attend the church of our choice, and not be frightened over having a Bible. In some countries, Christians are beheaded for their beliefs. Because the freedom ensured to us by our veterans, girls can be educated. My sister wants to become a doctor. If we lived in parts of the Mid-East, she would not be allowed the opportunity to go to school. Having an education is important to my family. Flying our flag is a luxury and freedom to my family. When we see it waving, my mom always says it gives her chill bumps. She told me once that it is a legacy for our family. I really didn’t understand that as a freedom, but I do now. Many of my family members have served and even given their life for me to be able to fly my own American flag. Our flag stands for freedom to my family. Freedom means so many things, such as my dad standing on a line, girls earning an education, my family flying our flag and worshiping my God. My family is grateful to every American veteran and their families for the freedom that they provided unselfishly. What Does Freedom Mean to My Family? “I may disagree with what you’re saying, but I will defend to the death your right to say it,” Voltaire said. This is a man who believed in the power of freedom of speech. This freedom is not just important to the United States as a country, but to the citizens who make up America, the laborers, the students and the families. Why does this specific freedom mean so much to my family? My family is very strongly opinionated. We like to sit around the dinner table and discuss current events that are happening. As everyone listens intently while others are expressing their opinion, one gets the sense of why the right to have a voice on the matter is so important. It is because humans have unique minds, and everyone deserves to think for themselves and say what they feel, for words and the human mind are the most powerful influences in this world. What doe a human have if he has no earthly possessions? Some would say nothing, but I would beg to differ. You have your creative thoughts and your unique opinions. You should have the right to express such powerful possessions in words. Franklin D. Roosevelt once said, “Sometimes we fail to hear or heed these voices of freedom because to us the privilege of our freedom is such an old, old story.” As this quote refers to, freedom of speech is often taken for granted by Americans. We have grown up with the freedom to speak our mind and express ourselves, sometimes forgetting that few have the same right. We forget the many who cannot stand up for what they believe, those who are silenced and even persecuted for their political views, social beliefs, or their religion. These are powerful freedoms my family practices daily yet they are so easily forgotten. For example, students at my school have the opportunity to say the prayer and pledge every morning, yet so often it is mumbled through hunched shoulders. Those proud words that pledge our allegiance to our country are slurred. The prayer that allows us to represent our religion is rushed through so we can move on to more important matters. Those freedoms are seen as more of a nuisance than a privilege. Yet without freedom of speech, those dinner table discussions with my family that I look forward to every night would never happen. The United States wouldn’t be where it is today without these very important freedoms. As citizens of this great country, when given the chance we need to practice these freedoms, whether it is as simples as saying the pledge, engaging in a dinner table debate with your family, or even standing up for what you believe in. These freedoms we sometimes view as minor are the backbone of American families.